Finished with generous coats of Mineral oil and finished with Mineral Oil/Beeswax blend. Under encouragement from my wife, I have joined the ranks of hobbyist and have offered my boards for sale on Etsy! If you are interested you can see them at DoubleG Wood Works. I know all you guys are talented enough to make your own but hey marketing right?? They looking good,but I’m not shore is mahogany good type of wood for cutting board. Also if you are looking for better type of pattern,more randomized,try to use CB designer ,it helps a lot. Very nice Gary. You should link your etsy shop in your signature line. They looking good,but I m not shore is mahogany good type of wood for cutting board. Also if you are looking for better type of pattern,more randomized,try to use CB designer ,it helps a lot. But sure i will take a look at it. Oh and as for the African Mahogany, Hardwood Lumber Company of Dallas says it’s good to go. I have used it on a couple and will continue to monitor how it works out. 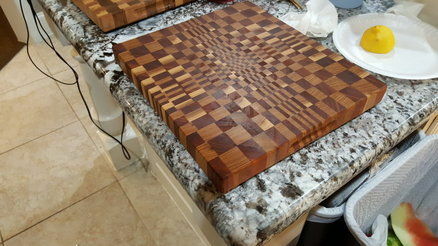 This is a nice cutting board and the pattern is interesting. If the mahogany is hard, there shouldn’t be a problem. Heck, even hard maple needs to be flattened occasionally.